Market Square is open seven days a week for all your shopping needs. Check back here for any special or extended trading hours throughout the year. Individual stores may have different trading hours than standard centre trading hours. See individual store pages for details. 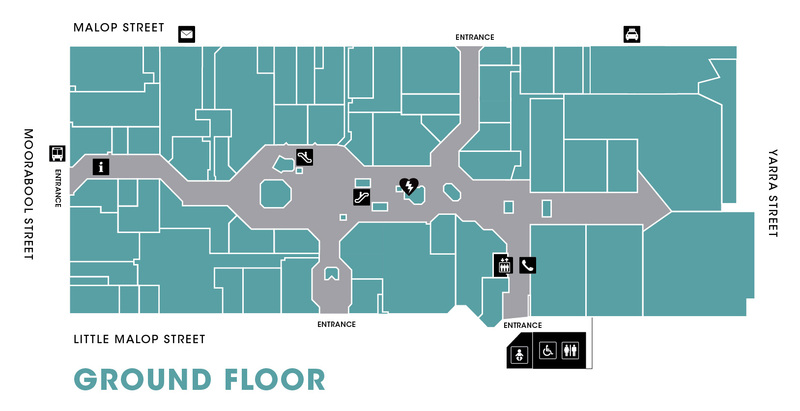 Market Square offers a number of accessible facilities for customers including accessible toilets and accessible car parking spaces on all of our levels. We offer free hire of wheelchairs during Centre Management trading hours and there are recharge points outside Harris Scarfe for those with electric wheelchairs. Assistance dogs are welcome. Parent rooms are conveniently located on both levels and are fully equipped with changing facilities, private feeding rooms, microwave and nappy dispensers. If you’re looking to take a break with the kids, our children’s playground is located at the Food Court on Level 1. Centre Management is located on Level 1 (beside Harris Scarfe) and is open Monday – Saturday. Looking for other things to do in the area? Drop by the visitor information booth located near the Moorabool Street entrance on the ground floor. The friendly staff will provide you with great advice on local attractions, events and things to do in the region. To purchase a gift card please visit Centre Management (located on level 1 near Harris Scarfe). If you lose or find an item while shopping at Market Square, please report to Centre Management. Collection of lost property can be made during Centre Management open hours.